As Nikki always says that the best part about being in this business is "your friends become your dear clients and your clients become your dear friends." Such was the case with Alex. When we first met him it was like working with any client and she could sense him questioning everything. To his credit he had never hired a planner before and he wanted to throw 40th birthday party for his wife that was out of the box. He was also very particular about creating an experience for his guests and therefore we chose to hold the event at the new OUE Skyspace in downtown. At seventy one stories high, it is the tallest building in Downtown Los Angeles and needless to say the views are spectacular. 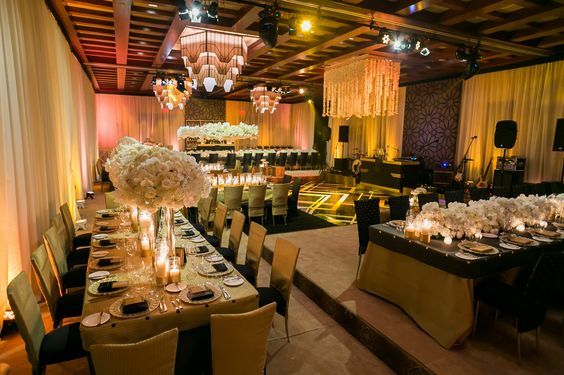 Great Gatsby theme was chosen to also pay compliment to building interiors which are black, gold and white. At the first design walk through, our thought was to make the celebration not only interactive but that appealed and touched all five senses. We threw ideas back and forth and discussed the layout of the event. At the second walk through we invited all the vendors that we're going to play a vital role at this event including our caterer Wolfgang Puck's team. Menu was discussed in great detail along with lighting, DJ, rentals and a few others. 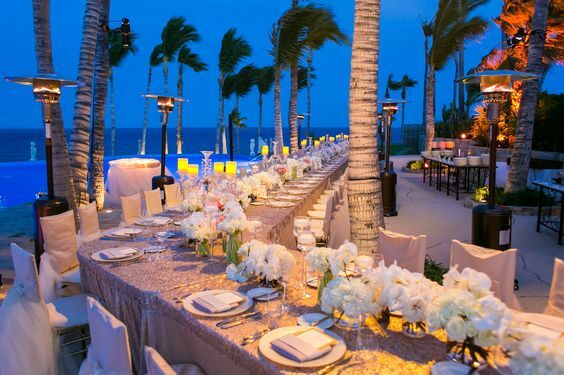 We then discussed the entire guest experience from the time they arrived to the location, to check-in at the lobby that was handled by two Exquisite Event staff members. Guests were then escorted to 54th floor for the experience and finally 70th floor where the event was taking place. A black carpet runner with black and gold rope and stanchion was placed in front of the step and repeat bearing Lizna's name and logo. Our entertainers wearing Great Gatsby attire welcomed the guests while photographer took photos of the arrivals. The formal entry into the event space was draped in black velvet and gold tassels. 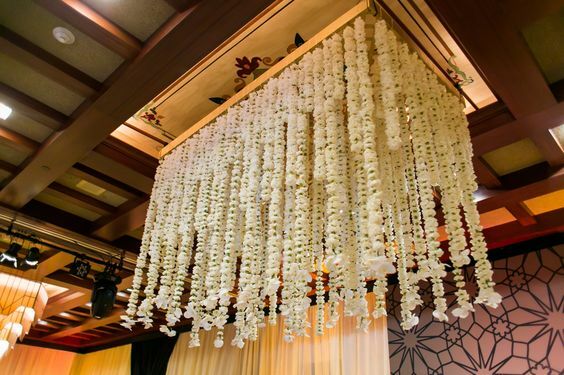 As guests entered the space, two over sized flower arrangements with white feathers, flowers and draped in pearls sat atop tables to create the big WOW factor. Our ladies from the entertainment group in Gatsby attire stood at the entrance to greet the guests and waiters stood carrying specialty drinks to offer. Entire space was transformed with black and gold custom furniture and lighting was chosen to create a candle like mood in chocolate brown and warm amber. Great Gatsby movie was playing on a loop behind the DJ booth. Dance floor was black with gold logo of the birthday girl. Wolfgang's team did a superb job with food. Initial hour was tray passed hors d'eouvers with food stations opening shortly after consisting of sushi, sashimi, steak and slider station and decadent array of desserts. We had hired an amazing magician who strolled the crowd and entertained guests along with photo booth and Gatsby dancers who opened the dance floor after performing a number. Lizna was invited by the magician on the dance floor where he performed a trick and then invited her to cut the cake. Our Gatsby entertainers sang happy birthday with all guests joining in. High light of the evening was when Alex and Lizna's children spoke to their mother in the most eloquent manner. Alex thanked his guests for coming. Late night snacks were tray passed at midnight and the party lasted till 2 am. and ended on a very high note. The best thing for Exquisite Events was to work with Alex and in the end develop this amazing friendship. The best compliment Nikki received was when she would suggest some idea as they got closer to the party date he would say " I defer that to you ". We look forward to creating many more special memories for this special couple and their friends. 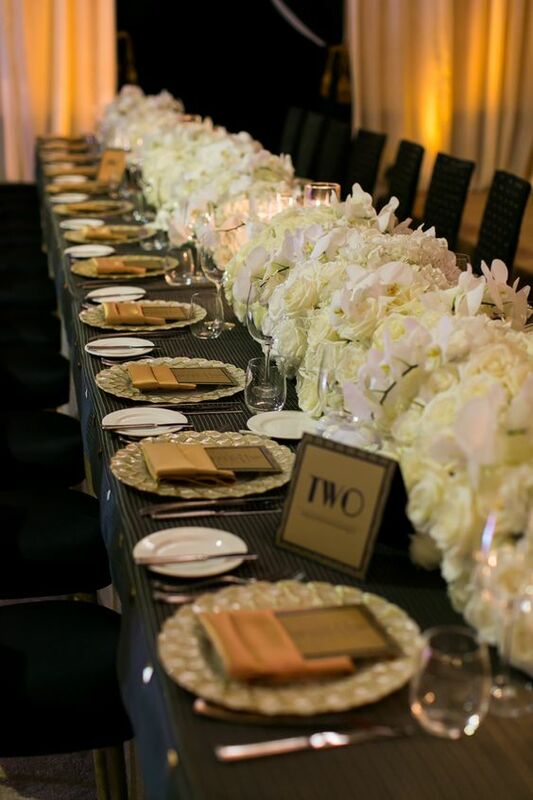 When a good friend approached us to plan her husband's surprise 70th birthday party, we were ecstatic. The party was literally planned in one week. 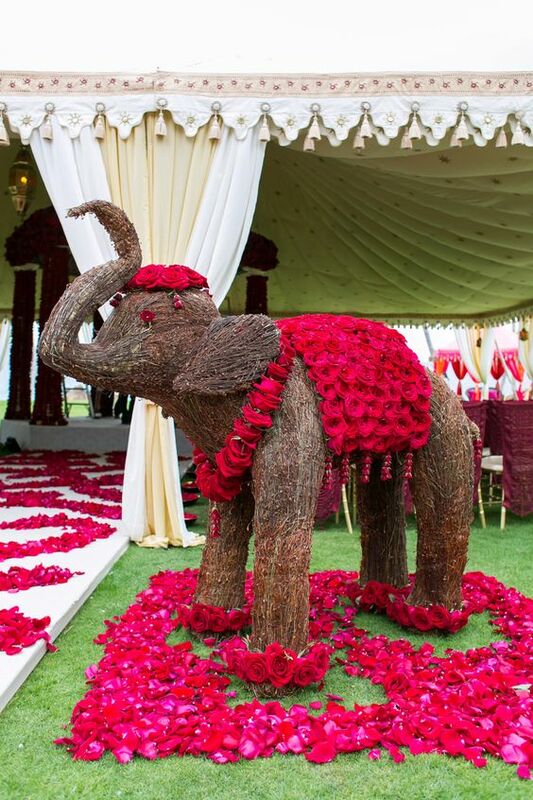 Everything that client loved was incorporated in the evening from the menu, desserts, favorite color, band etc. 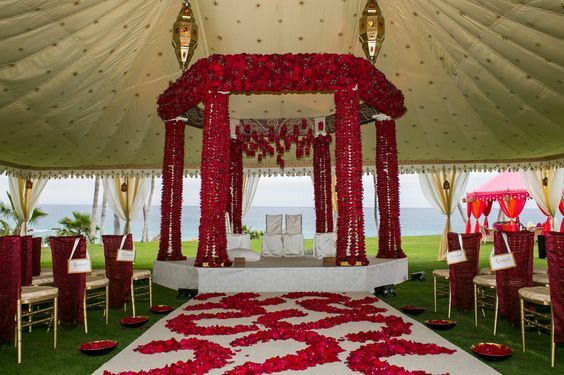 Since red was his favorite color we decided to incorporate that in our flowers and lighting. Client's home is clean and modern with outdoors and indoors all becoming one area. Mirror tables accented with silver chivari chairs were used as an L shape extending from the inside to outside. 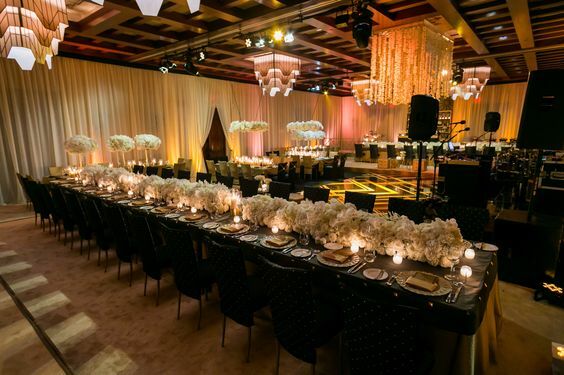 Flowers in all shades and hues of reds lined the tables in various modern containers with candles dispersed throughout the center of the table. White chargers in marble along with flatware with white handles gave a masculine vibe while red napkins gave that pop of color. Pressed glass water goblets along with different champagne flutes further elevated the table setting. 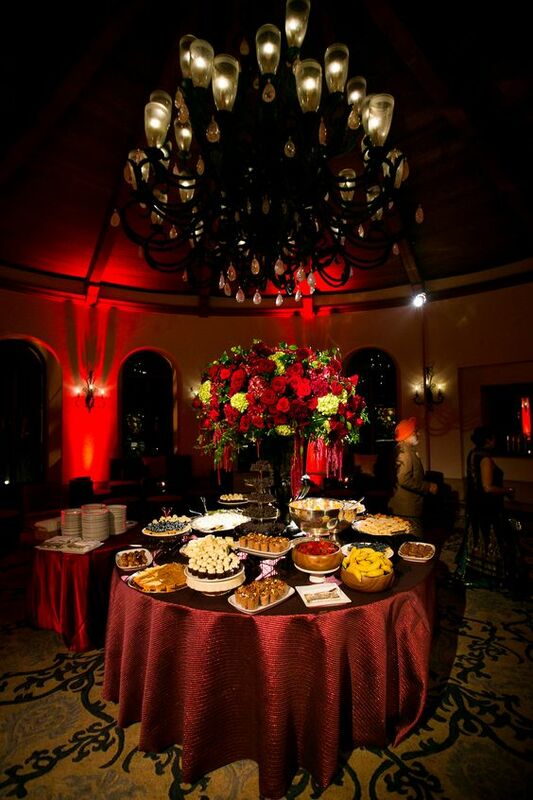 Once it got dark, red lighting created a romantic and elegant ambiance. It was a beautiful night and when clients danced under the perfectly lit starry night to the song " unforgettable " it was pure magic. Couples danced to the live jazz band and enjoyed decadent food. Cake cutting was heartwarming with band singing happy birthday and the entire family who had traveled from near and far joining in. Needless to say our client was truly surprised and enjoyed the night immensely. As New York Fashion Week comes to a close... the presentation of the upcoming Spring/Summer 2018 collections were nothing short of exquisite! With the Primetime Emmy Awards this Sunday and award season upon us, we definitely see some major contenders that will be worn by some of Hollywood's stars. Some of our favorites came from Marchesa, Michael Kors, Carolina Herrera, Alice + Olivia, and Naeem Khan to name a few. We look forward to hearing what your favorites were! Marchesa's Georgina Chapman and Keren Craig continued their fairytale feminine style with a beautiful color palette and use of florals and pearl strands. Michael Kors defined causal chic with a gorgeous collection that made you immediately want to take a beachside vacation. Carolina Herrera showcased her timeless style with 50's inspired silhouettes and classic color hues and patterns. Alice + Olivia gave us prints, prints and more prints. Naeem Khan showed cases detail and embellishments such as fringe, florals, lace and so much more! The past couples months we have seen Nikki and Madiha in the news from their work to attending parties and more. Here is a recap just in case you missed it! LA Confidential - If you check out the latest issue you can see two familiar faces. Nikki & Madiha both attended the Grand Opening of the Intercontinental Downtown Los Angeles. Modern Luxury's Angeleno - Nikki & Madiha were both featured in the Modern Mom section. 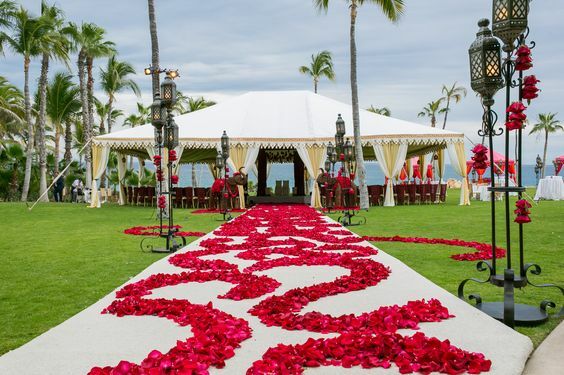 Grace Ormonde Wedding Style - Designer profile on our mother-daughter duo! It is hard to believe it has been 20 years since that fateful night that Princess Diana died in a car accident in 1997. She was someone who was admired by millions around the world for her poise, grace and style and I'm sure those are the same people that were glued to the TV in 1981 to watch her wed Prince Charles. I was 1 when she got married so obviously do not remember the nuptials in real time but I remember visiting family in London in 1987 and watching their recording of the wedding- I was in awe! I distinctly remember that 25 foot train of her David and Elizabeth Emmanuel dress as she walked down the aisle of the church. And who could forget those long taffeta poofy sleeves which were so 80s quintessential! Ever since then, Princess Diana has been someone who Nikki and I admire and was such an inspiration because of her style, grace in how she conducted herself within the royal family and her humanitarian efforts. She was the epitome of class and lives on through her sons who continue her work around the world.